While I always seem to enjoy a good middle grade novel, I find that I don't read them near as much as I'd like. 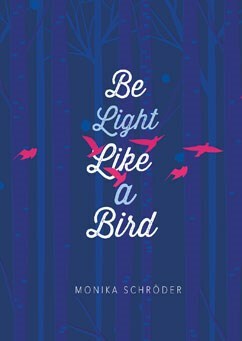 So when Monika Schroder asked me if I would like to review her latest novel BE LIGHT LIKE A BIRD, I jumped at the chance. This novel seemed to epitomize everything I love about middle grade books. It's a sweet coming-of-age story about a young girl who is trying to cope with the loss of her father. BE LIGHT LIKE A BIRD tells the story of Wren, a twelve year old girl whose father has recently died in an airplane accident. Naturally her life is turned upside down, but things get even worse when her mother decides to pack them up and move... and move again... and move again. Wren's relationship with her mother begins to feel the stress of their lives, and Wren finds comfort in a rather odd (and sad) way. She buries the dead animals that she finds on the road. When Wren and her mother finally settle in Michigan's Upper Peninsula, Wren finds herself in a new school with no real friends. She finds a sanctuary in a Pete's Pond, a place where she can watch and draw birds -- a hobby she used to do with her father. Unfortunately, Pete's Pond is scheduled to become a landfill. When Wren is assigned a school project, she teams up with Theo, another boy who doesn't have many friends. Together, they fight to save Pete's Pond and its wildlife from destruction. In the process, Wren learns some important lessons about life and family... and she begins the path towards healing! I really enjoyed BE LIGHT LIKE A BIRD! The story is incredibly sweet and entertaining, yet it also managed to delve into some important issues for middle grade readers. Wren was a wonderful character who touched my heart, and I loved seeing how much she matured by the end of the story. I also really appreciated that this novel explored the difficult issues of grief and bullying while also leaving readers with a sense of hope. There are just so many things to like about this story. I truly loved how this book explored the theme of grief. I would hope that some young readers would find comfort (or at least relate) a bit to Wren. The grief she was experiencing at the beginning of the novel almost broke my heart. She was burying dead animals for some sort of closure, for goodness sake! But I also liked how the author showed how grief manifested in Wren's mom. I think it was a great message to show that everyone deals with loss differently. And that we don't always understand the reasons why a person acts the way they do. Another wonderful thing about this novel was how it explored the ideas of family and friendship. Wren was definitely feeling alone after the loss of her father and her mother's strange behavior, and her attempts to fit in with the popular girls at school didn't help matter. However, she found a friend in Theo, a boy who lived with his father because his mom died when he was younger. These two learned to trust and find comfort in each other, and I loved how their friendship was depicted. Finally, I appreciated that the author chose to tell a side story that dealt with the environment and conservation. Not only were these important topics for a middle grade book, but I loved how Wren and Theo decided actually do something about the destruction of Pete's Pond. They worked together to bring this issue to the attention of their townspeople and politicians... and actually ended up making a difference! As much as I enjoyed BE LIGHT LIKE A BIRD, I have to say that it was a little predictable; however, that didn't bother me at all. It's important to keep in mind that the novel was written for middle grade readers -- not discerning adults. It's supposed to have a happy ending with most things being resolved; and I have to say that if things didn't work out for Wren, I would have been disappointed. I highly recommended BE LIGHT LIKE A BIRD for book clubs and the classroom. There is a discussion guide available with twelve thought-provoking questions. Some of the themes you might want to explore include grief, loss, new starts, friendship, family, environmental concerns, action, closure, and forgiveness. Overall, BE LIGHT LIKE A BIRD is a wonderful middle grade novel. Highly recommended! I think predictable is fine in a middle grade story because it's probably not all that predictable for its target audience. This book sounds really good. I just got this book from Monika last week. I'm glad you liked it. I should be able to get to it soon.